Badlands Bride is set in Colorado in the late 1800's. Lily HIghfill and Mason Donnelly are the two main characters. Lily is the daughter of a very prominent family from Boston. She has lived for years with her Aunt in Denver and is looking forward to finally going home to Boston. Mason is a journalist who lives and writes in the West. He is suffering from writers block. The two meet when Mason and Lily are both at her grandfather's fossil dig in the Colorado badlands. Both are very appealing characters. This story has a great journey to the HEA. There is danger, excitement, romance, and a great many twists and turns before we get to the HEA. Both Lily and Mason have make changes in their lives and their perceptions in order to have a happy ending. One thing thtat kept the story interesting was that it is hard to tell who is the good guy and who is the bad guy until the very end of the story. One final twist in the story really blindsided me. Look for a good story with a great setting in Badlands Bride. Pocket Book published Badlands Bride by Adrianne Wood in 2012. I received an ARC of Badlands Bride from Edelweiss. Checkmate My Lord is set England in the time of Napoleon. The two main characters, Catherine Ashcroft and Sebastian Danvers, Earl of Somerton are neighbors. Catherine is newly widowed. Her husband, Jeffery, had not been home for years and her marriage had been over for a long time. Just before his death he wrote her a series of strange letters and Catherine goes to Sebastian asking for help in finding out what the letters really meant and how Jeffery really died. That action sets up the story. I have often said that in romance it is not the destination but the journey that makes the story. While Checkmate My Lord is a very pleasant read the plot in is one that has been used many times. England is at war with France and has a secret spy network that is being threatened. The book is very well written but there were no surprises in the plot. That made the journey very predictable and I knew what was going to happen long before I got to the end. There were also several oblivious hooks for future books that did not add anything to the story line. An added problem for me was the fact that this is the second book about the spy network and I have not read the first book. Even though a lot of back-story is added in the first few pages of the book I was still left in the dark about some of the side characters and what had happened in book one to set up this story. I recommend reading book one before Checkmate My Lord. All in all for me Checkmate My Lord was a bit of a disappointment. Sourcebooks published Checkmate My Lord by Tracey Devlyn in 2013. I received an ARC of Checkmate My Lord from Netgalley. The Warrior Laird tells the story of Lady Maura Duncanson who is trouble to all who know her and Laird Dugan MacMillan who is working to protect his clan. Lady Maura does not like her family and is trying to get away. Duncan has to raise enough money to pay rent on the land his family used to own. There is a lot of bad blood between Duncan's family and Maura's. When Maura escapes from the soldiers escorting her to an unwanted marriage to an old man. The story moves briskly from that point. I love Lady Maura. She is nothing like others in her family. Her only goal as she escapes is to find and save her younger sister Rosie who has been sent away. She has a lot of love to give and while she finds that she loves Dugan she knows that her family history will prevent them from being together. Dugan knows that he cannot have Maura for the same reasons. Both are very strong well drawn characters. I loved seeing them interact with each other. There are some very interesting secondary characters that help keep the story moving. Dugan's quest for money to save his clan adds a nice touch of tension to the story. There is enough mystery, romance, and danger in The Warrior Laird to satisfy anyone. The Warrior Laird makes very good use of the Highland theme by adding new twists and turns to a familiar journey to an HEA. Avon published The Warrior Laird by Margo Maguire in 2012. I received an ARC of The Warrior Laird from Edelweiss. Elizabeth Hoyt has done it again. Another great Maiden Lane story with another Ghost of St. Giles. Godric St. John has been a ghost of a man since his wife took years to die. He is also one of the Ghosts of St. Giles. Two years ago he was blackmailed into marring Lady Margaret Reading. She was pregnant with another man's child (a man who had just been murdered) at the time but miscarried shortly after. She has been living the the country and Godric in the city but as the book starts that is changing. Margaret has come to town with two goals. Get pregnant and find her lovers murderer. Margaret or Megs as she prefers and Godric are both wonderful characters. Both have lost people they love and both think they cannot love again. It is really fun to see how they both begin to live and love again. Margaret also wants to find the person who killed her first love. That brings the story of the Ghost and a reappearance of the lassie snatchers from the last book into the story. The Ghost is in danger again. He wants to keep his identity from Margaret but things happen that make it harder and harder to do. There is a set up for the next book woven into the story. The characters for this story appear but really do not play a part in Lord of Darkness. They did not add to this story. They only appeared as a set up for the third Ghost of St Giles book. Grand Central Publishing released Lord of Darkness by Elizabeth Hoyt in 2013. What Happens in Scotland is the first published novel by Jennifer McQuiston but the only thing that gave that away were the acknowledgements published at the end of the book. What Happens in Scotland is very well written, has an interesting plot and great characters. Lady Georgette Thorold has come to Scotland to visit her cousin. She is a widow and does not plan to every marry again. In fact when we meet her the first thing we learn is that she “hated brandy almost as much as she hated husbands” and that she smells like brandy and has just acquired a husband she does not remember marrying. James MacKenzie is the husband she acquired but he does not remember anything about the night before. The last thing he wants is a wife so he is having a hard time believing what people are saying he did. For the first half of the book the scenes switch between James and Georgette as they search the town trying to find each other and find out what really happened last night. Both James and Georgette are actively interacting with others and as they do there is more plot and character development. By the time they meet again their characters are fully developed, the plot is fleshed out and the story is ready for the rest of the action. I love active plot and character development and this is some of the best I have seen. In the second half of the book we see what happens when they finally meet again. There is enough action, tension, and romance to satisfy anyone. I am looking forward to more books Jennifer McQuiston. I think after you read What Happens in Scotland you will be too. Avon published What Happens in Scotland by Jennifer McQuiston in 2013. I received a free ARC of What Happens in Scotland from Edelweiss. James Hartley and Ellie Vyne are certainly not meant for each other. The Hartley’s and Vyne’s are sworn enemies. But when they meet at masquerade ball magic happens. James falls in love with the mysterious lady he meets in the garden not realizing it is Ellie. The story unwinds from there. James is wealthy. Ellie dresses as a man and wins at gambling to support her family. She ends up with some of the Hartley family jewels. That is just part the first part of the story. There are many twists and turns as James searches for the woman he wants for his wife. Even after he realizes that it is Ellie he is not to be stopped. This is a fun story with some interesting twists. James and Ellie are both great characters. The secondary characters add a great deal to the story. After a long and interesting journey both James and Ellie get what they want and it turns out to be each other. If you want an entertaining read with lots of twists and turns and great characters pick up The Wicked Wedding of Miss Ellie Vyne. Sourcebooks published The Wicked Wedding of Miss Ellie Vyne by Jayne Fresina in 2013. I received an ARC of The Wicked Wedding of Miss Ellie Vyne from NetGalley. 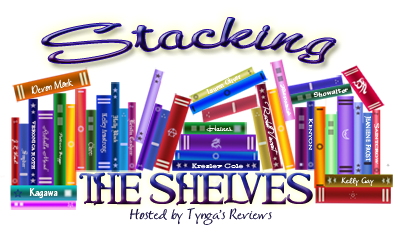 Stacking The Shelves is all about the books I am adding to my shelves each week. Thank you for letting me share my excitement for my newest books. I am still on the world cruise but for the first time in 6 weeks I have new books. The free wifi in the Marriott at Sydney was great. My Kindle logged on so I purchased 3 new books from Amazon. I am in Hobart on their free wifi today. Three are by Jennifer Estep. They are Venom, Tangled Threads, and Spider's Revenge. The other on is by Evangelina Anderson. It is Claimed. I like J. 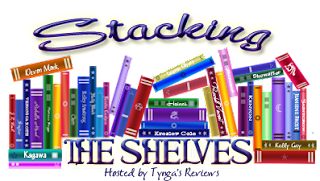 A. Jance’s books and have read all the Joanna Brady and Ali Reynolds series. I think this latest Ali Reynolds book is on of the best in the series. Deadly Stakes starts by introducing a mixed cast of characters. There are Lynn Martinson, Chip Ralston, and A.J. Sanders. All three are in trouble when two different murder victims are found near the same area. Ali enters the picture when Lynn’s mother asked Ali to find out the truth. Ali barely enters the story at first. There are two story lines that seem to have nothing in common. Then J. A. Jance uses her magic to weave them into one great story. That happens when Ali is brought into the story. There are two different mysteries to be solved, some favorite characters to visit again and a great ending. Prepare to be surprised. Deadly Stakes is a good addition to the Ali Reynolds series. You can read this as a stand alone but it is better if you start with the first book, Edge of Evil, and read them in order. Touchstone published Deadly Stakes by J. A. Jance in 2013. I received a ARC of Deadly Stakes from Edelweiss. Easter Diamond is back in Polterheist and getting into the same trouble as before. To pay her rent she is working at Fenster & Co, a local department store, as a Christmas Elf. In keeping with her background she is the Jewish Elf. Some of the elves and other characters are quitting with no notice. They just disappear without even turning in their costumes. People who have worked during past Christmas seasons are saying that this year it is different. There is a feeling of evil that was not there in the past. Then the props start attacking people. To add to the problem trucks carrying goods for the store are being hijacked. That brings Detective Connor Lopez on the scene. Once again he and Esther are throw together and have to save the day. Look for fun dialog, great action, and all of the great side characters that were in previous books. The paranormal is an evil presence that Esther believes in and Connor does not. That difference adds additional interest and tension to the story. This is book five in the series. Most of the world building has already been done. There are reminders dropped in around the story and you can read this as a stand alone. However I recommend starting with book one, Disappearing Nightly. Polerheist is a book I purchased not one I agreed to review. DAW published Polterheist by Laura Resnick in 2012. I received an ARC of Sacrifice the Wicked from Edelweiss. I did not realize that it was part of a series, a series that is more like a serial. Sacrifice the Wicked is several books into the Dark Hunter novels. It seems to start where the last on left off and ends very abruptly. I would not recommend reading this series out of order. The world building was done in previous books. In Sacrifice the Wicked I was dropped into the world with no explanation. It was the same with back-story. Side characters appeared with no explanation of who and what they were. While I read I got the impression I should recognize the world, know the back-story, and remember the characters. Having said all of that I liked the story enough that I will go back and find the previous books and will read the next book when it comes out. This is a fast paced book filled with tension. The two main characters, Parker Adams and Simon Wells, are front and center for most of the story. Parker is the Mission Director and Simon is suppose to be one of her Missionaries. (This is where you really need to know the world building and the back-story.) Parker is on the up and up, a really good director concerned for her people. Simon is on a plant but is playing for more than one side. When things start to go really wrong the two are thrown together. The story is built on things that happened in previous books. The action moves the plot forward putting characters where they need to be for the next book. Then it just quits. That is what made me compare it to the old movie serials. There is exciting action, some story movement but it leaves you wanting to know what happens next. Avon published Sacrifice the Wicked by Karina Cooper in 2012. The Scoundrel in the book is Nicholas and the Bride is Sophia. They along with Nicholas’s brother Langdon have been friends since they were children. Langdon is the oldest and the perfect son. Sophia is Langdon’s promised bride. Thus we have the triangle set up. The story revolves around the murder of Sophia’s Mother when all three were children. That murder has not been solved but a new clue has been unearthed. Sophia is determined to follow it and find the killer but she needs help. She turns to Nicholas for help, as Langdon would try to stop her from going into danger. With this set up the story moves rapidly forward. There is danger, suspense, romance and more danger. I liked both Sophia and Nicholas and often found Langdon clueless. It did make for a good touch to the story. This is the second book in the Regency Rogues series and the story line here is a continuation from the first book. While more information about the murder is uncovered in The Scoundrel Takes a Bride the mystery is not solved. That is left for the next book. Of course there is a really fun and exciting journey leading up to the HEA for Nicholas and Sophia. Ballantine Books published The Scoundrel Takes a Bride by Stefanie Sloane in 2012. I must have purchased Timeless Desire as it is not on the list of books I accepted to review. It still was on my ereader as a TBR. I like time travel books and this one caught my interest because it features a librarian as the main female character. As one of my many careers I was a school librarian or school library media specialist if the correct term is used. I have found that we librarians are always up for adventure. Panna is the main character in Timeless Desire. She is the librarian in the Andrew Carnegie Library in Carnegie, Pennsylvania and has just learned that there that the library is going to have a big budget cut next year. She has always been drawn to the statue of Colonel John Bridgewater, Viscount Adderly that sits in her library. When she finds a door to the past under the library stairs she meets the real thing. But wait, things are not as they seem. John Bridgewater certainly is not but James Bridgewater, now that is a different story. She does try to raise money for her library even though she is in the past. Both James and Panna are wonderful characters and are made for each other. In a romance it is always the journey that makes the story and Panna and James have a dangerous and exciting journey before they arrive at their HEA. There is plenty of mystery and a lot of twists and turns in the story. Be prepared to be surprised. James is an Outlander and that is why the term is used in the story and in the title. For me Outlander brings to mind another series and it was a little districting to see it used here as part of this series. It may be the same for other people but look past that and enjoy the story. Astor Blue Editions published Timeless Desire by Gwen Cready in 2012. The Scoundrel in the book is Nicholas and the Bride is Sophia. They along with Nicholas's brother Langdon have been friends since they were children. Langdon is the oldest and the perfect son. Sophia is Langdon's promised bride. Thus we have the triangle set up. The story revolves around the murder of Sophia's Mother when all three were children. That murder has not been solved but a new clue has been unearthed. Sophia is determined to follow it and find the killer but she needs help. She turns to Nicholas for help, as Langdon would try to stop her from going into danger. I recieved an ARC of The Scoundrel Takes a Bride from Edelweiss.